I love a bells and whistles musical as much as the next person. But the true magic of musical theatre is in the musical storytelling magic that sometimes if we’re really lucky, happens. As much as gold tap shoes and magic sets and a chorus of 20 is great fun, nothing beats the magic when words and music combine to tell a story from the heart. Yank! is one of those rarities. With a cast of 12, a band of 7 and a set that mainly consists of wooden crates, they create a world and tell a powerful story. 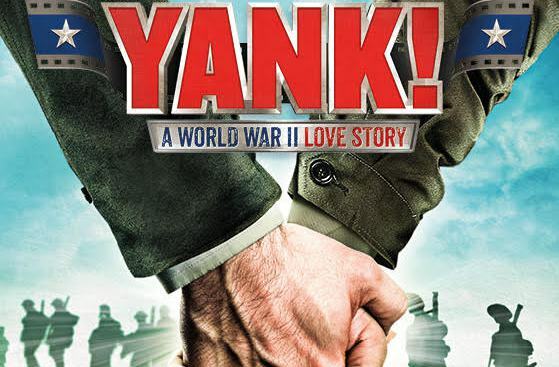 Storytelling, and the importance of telling your stories is at the heart of Yank! and the power of what is told and what isn’t is central to the piece. 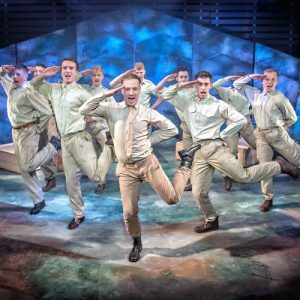 Drawn from oral histories, the real lives of military men in America it was first staged in 2010 at the height of debate over the repeal of ‘Don’t ask don’t tell’. Looking back to World War II and the time when homosexuality was punishable by 3 years in Military prison, 7 in civilian prison or being sent to the worst of the front lines, it’s a story of both progress and how far is left to go. The central love story of Stu and Mitch not only takes on the prejudice of the military, fellow soldiers and their families, but also, their own internalised homophobia. And while on one hand there is an incredible hopefulness to Stu, emerging from all he goes through with the hope of living a life true to himself, there’s Mitch who cannot come to terms with his own sexuality. 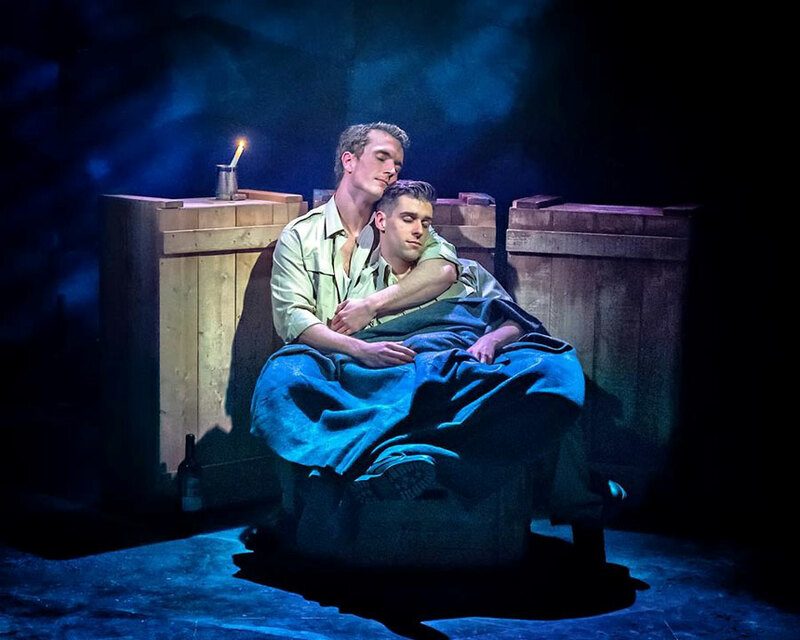 Scott Hunter and Andy Coxon are both charming and heartbreaking as Stu and Mitch, the soldiers thrown together by basic training who fall in love, trying to come to terms with their own feelings while hiding from the army. Confused about his lack of feelings for women, Stu is also mercilessly teased for not fitting in with his Platoon, and scared of becoming like the men from the typing pool he encounters. After a kiss with Mitch, and finding himself rejected- a result of Mitch’s own internalised prejudice- Stu is taken on by Yank! magazine Photographer Artie (Chris Kiely), a man comfortable in his skin-and sexuality. Artie takes Stu under his wing, teaching him the ways of his world in ‘Click’ in what is the most unexpected and wonderful use of a tap routine to talk about sexuality. It is a piece made by the stellar cast. And while the gentlemen of the company are exceptional, first mention should really go to Sarah-Louise Young who embodies every girlfriend/wife/mother and film star in the boy’s heads. Holding her own (and standing out) amid the crowd of men, she cuts through and gives heartbreaking and heartwarming renditions of period sounding music. Meanwhile as Louise, a reminder that gay women also existed in the army, she is a force to be reckoned with and a linchpin of this company. Meanwhile Chris Kiely’s nuanced performance as Artie, which starts as a charming tap-dancing flirtation covers an emotional arc of attachment and protection for Mitch, and a veering into a forced self-preservation and the darker side of men who did not ‘pass’. For every beautifully executed tap-step he gives a contentious performance of a man trying to survive in a world that does not want him. 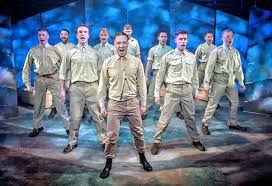 The rest of the Platoon and company are all of impeccable standard- from the comedic timing particularly from Kris March-Josesph and Benjamin Cupit, to the charm of Bradley Judge. There is a real sense of community and ‘family’ to the group. Meanwhile both the singing and execution of some incredible choreography (courtesy of Chris Cuming) makes this a true ‘company’ in every sense. It is a beautiful, and deceptively simple execution of this beautiful score by David and Joseph Zellnick and James Baker directs it with intelligence and compassion. Yank! is an emotive piece of theatre that leaves us with both unanswered questions and questions to ask of ourselves and our own society. We may look at the ending in 1945 and praise ourselves in how far we’ve come, but we don’t have to look very far to see these prejudices still exist both outside and inside ourselves. Don’t Ask Don’t Tell may be a thing of the past, but the inherent prejudice and fear LGBT people face is not. However Yank! is a piece full of hope- we can hope like our narrator does for Stu at the end, that he went off and lived a life of love and happiness. That he learnt to accept himself, and to be who he truly was gives us the impression, and the hope that he did. And while the fight continues for equality in the broader sense, the message Yank! gives, particularly to young gay people (and indeed older ones) is that if you can love yourself, accept yourself, and that you should, then that’s the first step. And that is a powerful, hopeful thing.